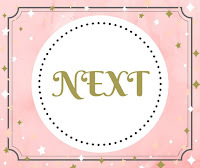 This month our theme is 'Men'...….can't they just be so difficult to create for sometimes? 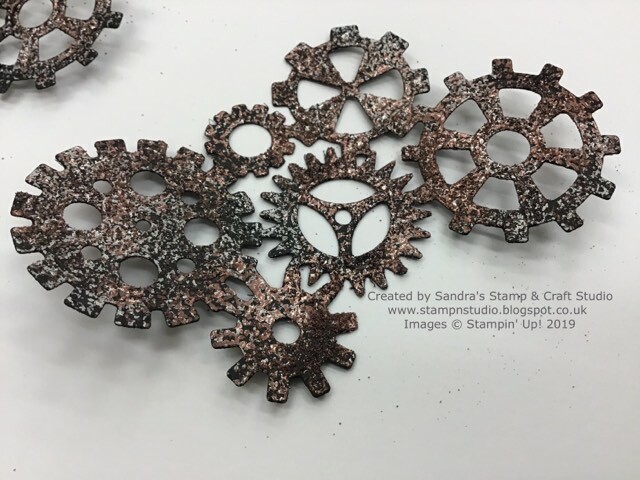 For my card today, I have revisited an old technique I have enjoyed creating for a long, long while. 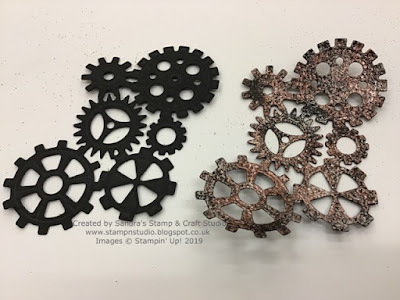 For this 'Faux Metal' technique, I have used the new cogs featured in the Classic Garage bundle from the Spring Summer catalogue. They are so gorgeous, I'm sure they will be featuring on some Mixed Media projects over the next few weeks, prepping for my 'One For The Men' class in April. Here I've assembled a few 'cogs', die-cut from Basic Black card, using the Garage Gears Thinlits Dies #148521. 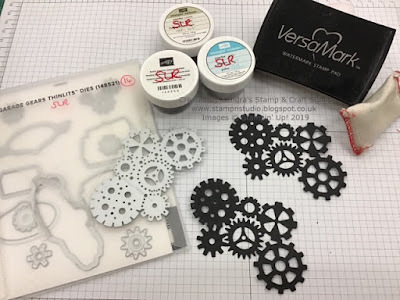 I'm sure every Avid crafter I know will have a few unusual items their crafting stash ! One of mine is a cheap exfoliating massage bath sponge. The rougher side I call my 'Aero effect' as the holes are larger and look like the holes in an Aero chocolate bar. Next it's time to repeat using Copper Embossing Powder. 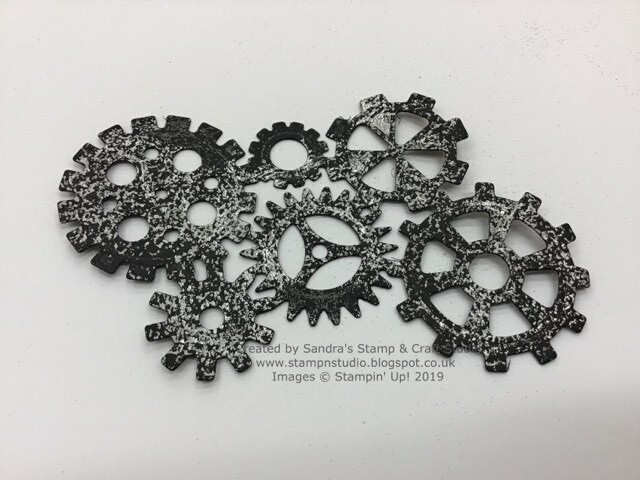 The holes on the sponge will randomly land in different places and so the Faux Metal effect will start to build. 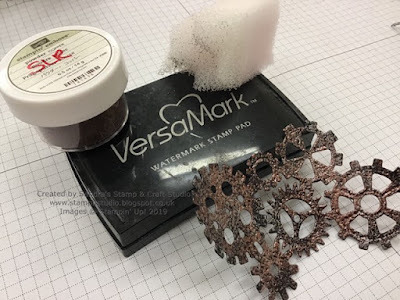 Lastly, I've added a little bit of Black Embossing powder in the same way. I hope you have enjoyed my contribution today and that you will enjoy the rest of your 'hop' around the globe today, clicking on the 'next' button below to hop to Janey and see what amazing creations she has created to share with you today. 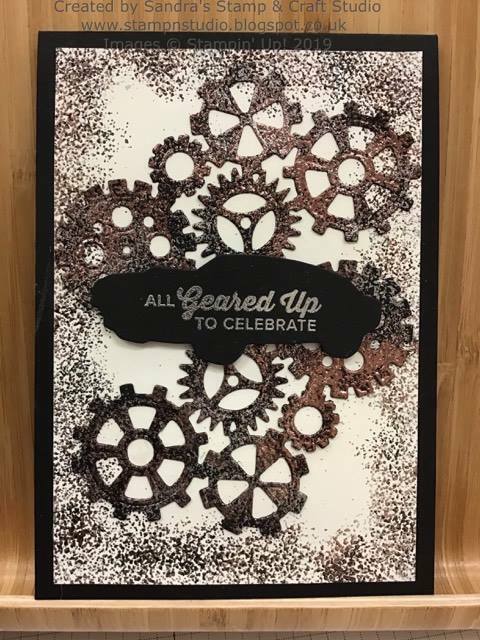 So love the texture you achieved on the gears! They look amazing! Thanks so much for sharing!